Sparrow of the Dawn is the newest addition to the Girly Bits Concert Series, which started a number of years ago as a way to pay tribute to Pam's favourite bands and catalogue the concerts she attends. Pam describes the polishes as "A colourful soundtrack" of her taste in music. 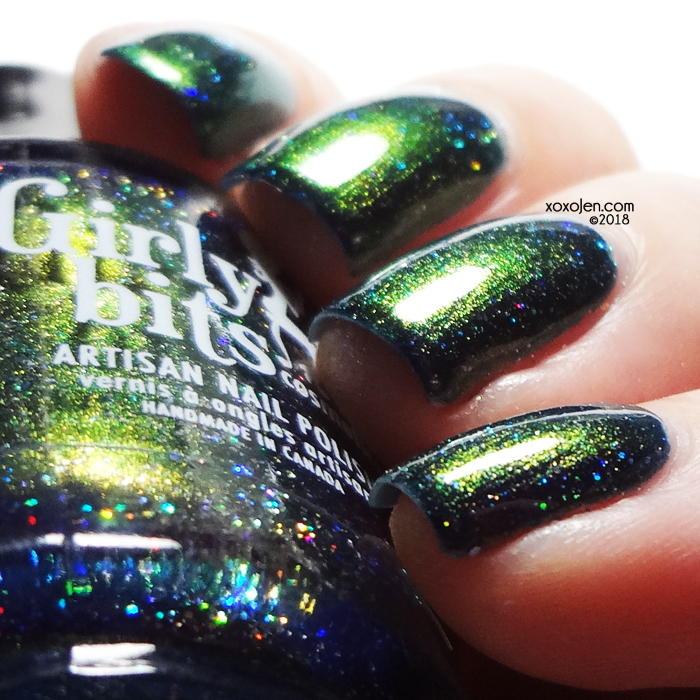 Sparrow of the Dawn is deep navy base, with a strong green-copper-pink multi-chrome shift, and a heavy dose of tiny holo glitters. It is 5 Free, cruelty free, and vegan friendly. 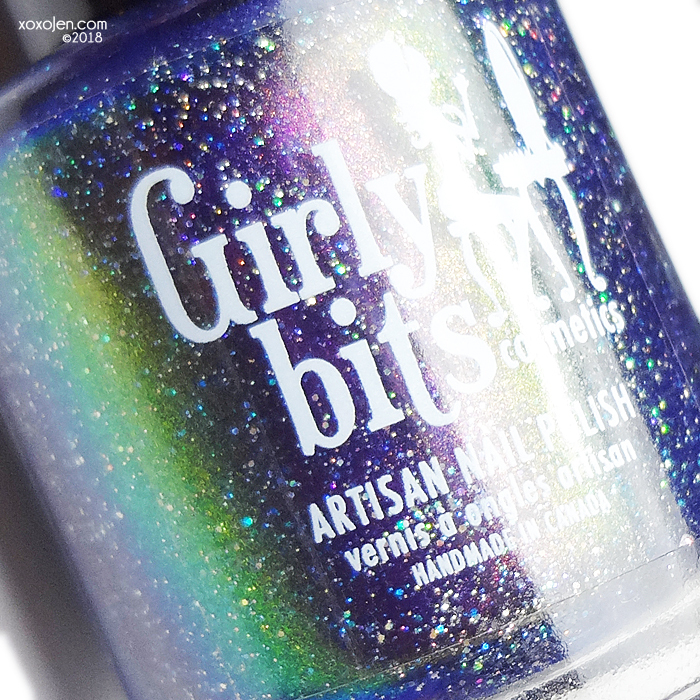 What an amazingly shifty polish! She's not shy, no contortionist poses going on here. I wore two coats with topcoat for photos. Below is more information from Pam about the polish's inspiration. Late spring/early summer of 2017, I started hearing this new song called Highway Tune on a local radio station (WRIF in Detroit) It really grabbed my attention. It was a band that I had never heard of before, but they sounded like well seasoned musicians and I was really digging their vibe. So I started looking into this band called Greta Van Fleet. It turns out, they are a group of young (and I mean YOUNG) guys from Frankenmuth Michigan. The singer is Josh Kiszka, and his twin brother is guitarist Jake Kiszka (22 yrs old). Younger brother Sam Kiszka (18) plays bass, and their friend Danny Wagner (19) is on drums. When I first started following them last year, the two youngest ones were still in high school and they had a mere 13K followers on IG. They gained a ton of traction last summer/fall, and have been on a whirlwind of a tour since. Their debut tune topped Billboard for 4 weeks. They have had a meteoric rise to fame touring with The Struts, and have opened for many big names artists including Bob Segar and G&R. They have played at numerous festivals like Coachella, and had the honour of receiving a personal invitation to play at Elton John’s Academy Award party. Their tour dates have been non-stop since last summer. When they first began rising in popularity, they didn’t even have an album out. They STILL don’t. They put out their studio debut EP in April of 2017, and then a double EP in Nov 2017 which contains 4 new songs, plus the original 4. We first saw them perform in MI at Pine Knob (DTE Energy Music Theatre) in September at RIFF Fest. I was BLOWN away. I saw them again at St Andrew’s Hall (In MI again) in December. By that time, it was getting hard to get tickets to their shows before they sold out. The first show at St. Andrew’s Hall sold out and they announced a second show which also sold out. I had purchased both CD’s and was mildly obsessed =) We obtained tickets to see them two more times. One at Rock on the Range in Ohio, and one at the Fillmore in Detroit. Both in May. (repeat- mildly obsessed) The show at the Fillmore sold out in seconds. Literally. And fans were NOT happy. They announced two more shows at the Fillmore back to back and they both sold out immediately. I was lucky enough to score 2 tickets to the 2nd show. Back track to the show at St Andrew’s Hall in December. I already had Sparrow of the Dawn planned, but not a release date. I KNEW I had to honour my new favourite band. The song that really made me fall in love with GVF is Flower Power, and Sparrow of the Dawn is taken from those lyrics. We had VIP tickets to that show, mostly because that was all that was available when I purchased. VIP has their own level, and their own bar and washroom area. I went to the washroom right before GVF came on stage, and as luck would have it I ran into Josie Wagner, sister of the drummer. We chatted a bit, snapped a selfie, and I told her about my plans for Sparrow of the Dawn. I asked her if she would like to see the samples and help in the choosing of the final colour. She was very excited about that! We exchanged contact info, and chatted about colour and finish etc, and I sent her some samples, from which she chose her favourite. I was heavily inspired by the cover art from their EP From the Fires, and chose to go with a multi-chrome to go with their retro 70’s vibe.